In 1767, Captain Michael Farley, a 4th generation descendant of Michael Farley, a settler of Ipswich, was chosen as the Representative from the Town of Ipswich to the General Court. Farley, a tanner by trade, and an officer in the militia was a man of forceful personality and unusual ability, and spent the remainder of his life in public service. The Town chose him as a delegate to the Provincial Congress of Massachusetts, 1774 in Salem and at Cambridge in 1775; He became the High Sheriff of Essex County, and was chosen as a member of the State House of Representatives. Farley fought for the Continental Army during the Revolutionary War and was appointed major-general of the Militia of Massachusetts in 1777. General Michael Farley died on June 20, 1789, at age 70, and is buried beside his wife Elizabeth at the Old North Burying Ground in Ipswich. Michael Farley married on December 21, 1745, Elizabeth Choate (1726-1795) daughter of Robert Choate. A tradition of the Farley family is that when the embargo on tea went into effect, Gen. Farley would not allow any tea in his home, but his wife would occasionally visit her neighbor, Dame Heard, and enjoy a cup of tea. She was, however a Patriot, and when a regiment of men were preparing for battle, with her own hands she filled each man’s powder horn with powder which was stored in the garret of her house. In 1777 nineteen-year-old Marquis de Lafayette left France and volunteered to serve in the Continental Army. When his company passed through Ipswich he was met by General Farley who removed his hat to salute the noble Frenchman and in doing so accidentally removed his wig as well. Other members of the welcoming party quickly removed their wigs in respect to Mr. Farley. Writing home, Lafayette remarked that the people of Ipswich were so polite that they not only bowed with their hats off but “with their wigs off as well”. Three sons of Michael and Elizabeth Farley fought in the Revolution. Jabez Farley (c.1755-1836) served in Captain Simeon Brown’s company and Colonel Wade’s regiment at Providence, Rhode Island. He married Lucy Rogers, daughter of Nathaniel Rogers, who died in childbirth in 1788. His second wife was Susanna Swasey (c.1768-1843), daughter of Major Joseph Swasey (d. 1817). In this 1943 photo, General Michael Farley’s house held a prominent position at the intersection of Market and Union Streets on the far right. 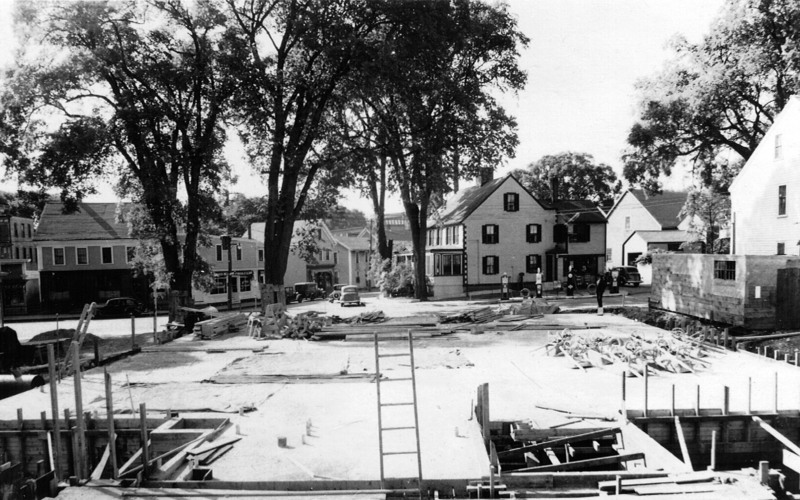 The Farley family home is in the middle of this photo of the corner of Market and Union Streets, taken in 1939 when the Post Office was being built on Market Street. The rear wing of the house was already being used as a service station. 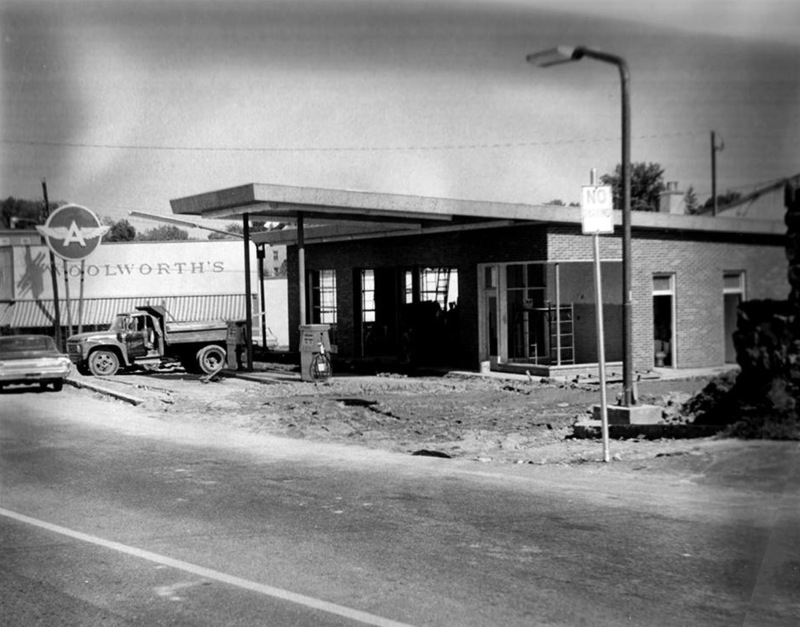 The building was torn down and the lot became the location of a modern gas station, which is now the Richdale store. 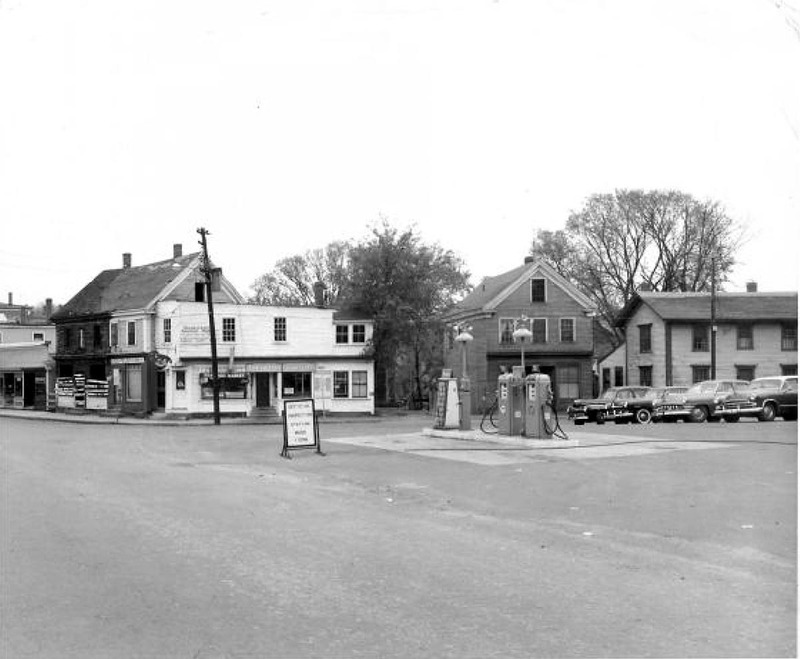 By 1950 the Michael Farley house had been torn down and was an automotive lot with gas pumps. A Flying A service station was constructed on the lot in about 1966. The building is now a Richdale convenience store. 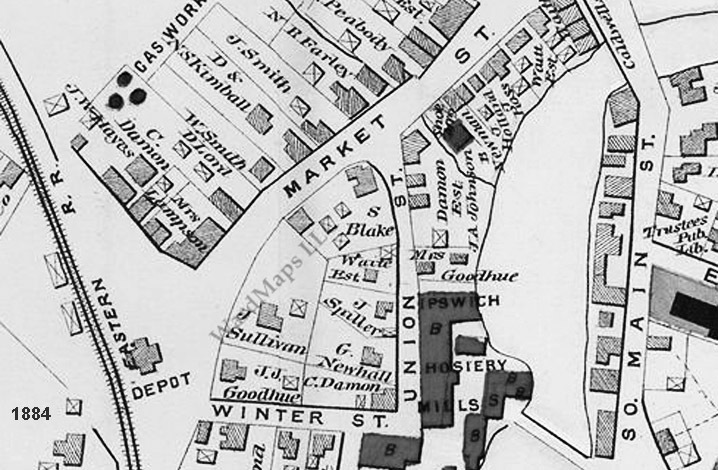 On August 6, 1684 Mesheck Farley, the son of Michael Farley (1) married, and his father built him a house at the corner of Market and Union Streets. 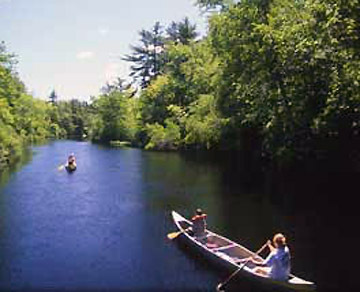 Several generations of the Farley family made their home there. 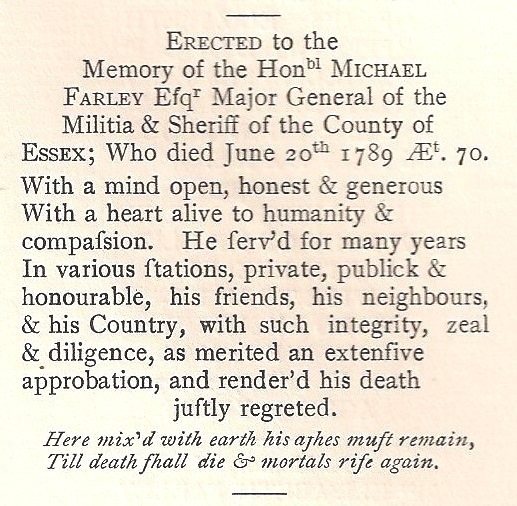 His son Michael (2) was the father of General Michael Farley. A new house was constructed after the Revolution, probably by General Michael Farley, who had plied his vocation as a tanner nearby. By an execution against Farrington, John S. Williams of Salem acquired possession Feb. 23, 1838 (Exec. No. 8, 188). John Brown sold to Jacob Brown, April 23, 1851 (451: 119). Francis Q., William G. and Jacob F. Brown sold to Abigail S. Blake, wife of Samuel Blake May 1, 1865 (684: 56). The heirs of Abigail S. Blake sold to Mr. David Grady in 1865. 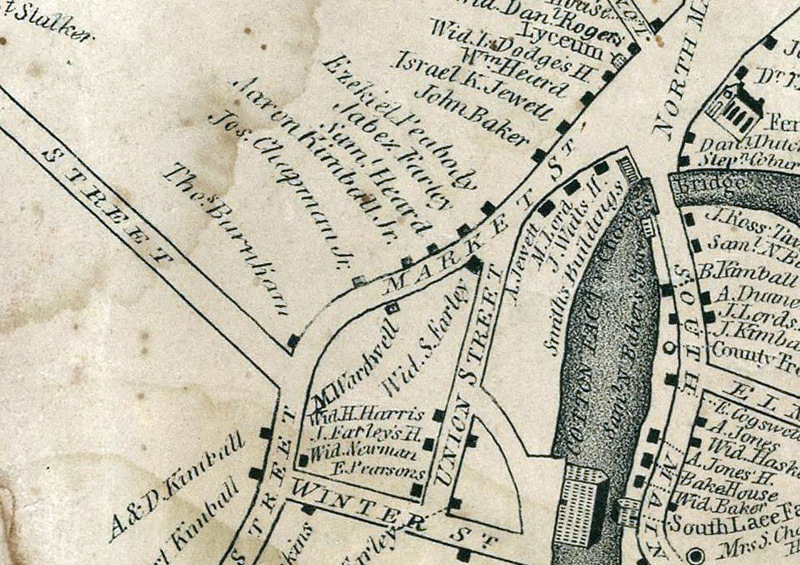 1832 map showing the home of Susanna Farley, the widow of Robert Farley at the corner of Market and Union Street. There is also a J. Farley house on Union St., and the Jabez Farley house is across Market St. All three houses were taken down in the 20th Century. 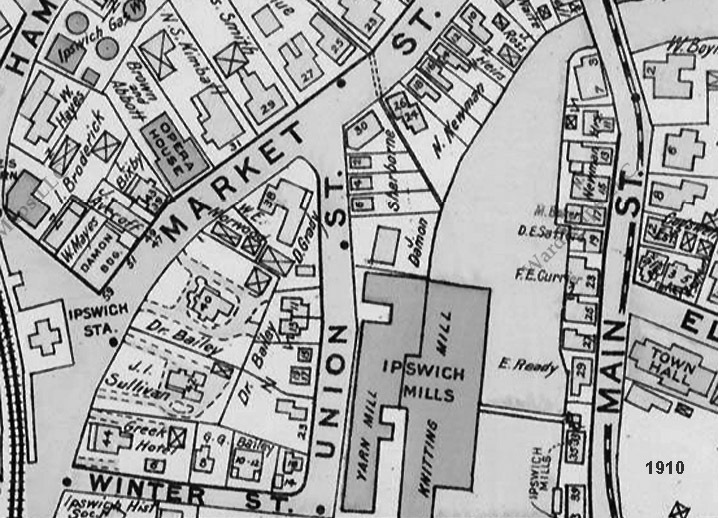 The 1910 map shows the Farley homestead owned by David Grady.